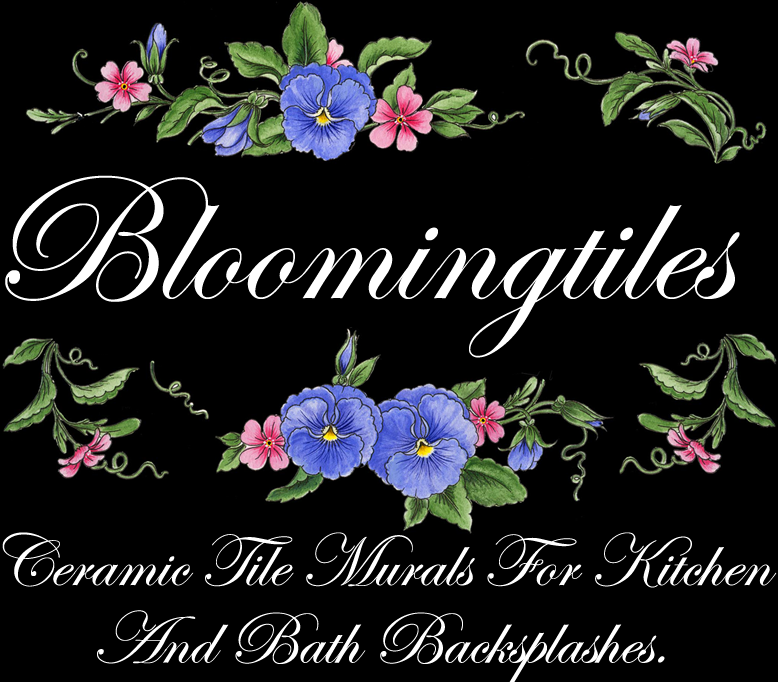 Bloomingtiles murals and accents will add a stunning focal point and personalize your home or business. 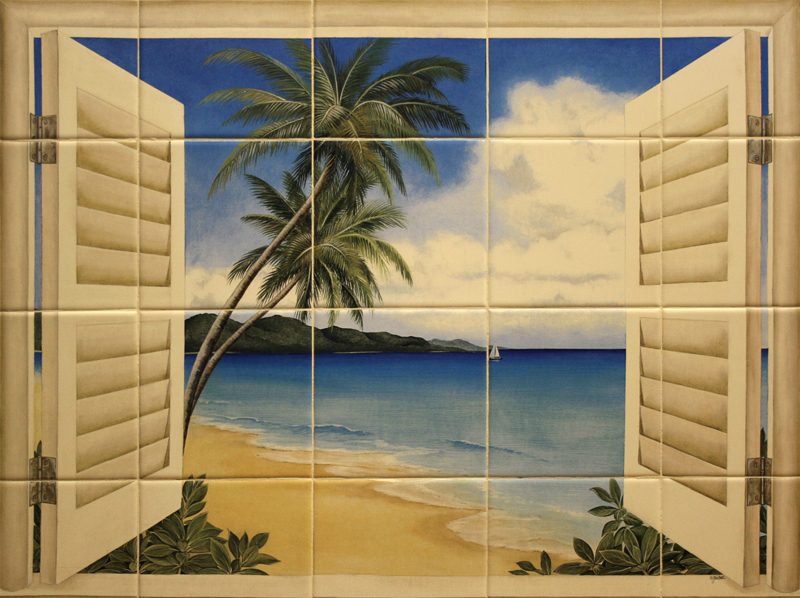 We offer medium and large sized murals with a collection of coordinating accent tiles. Julie has been hand-painting tile in her Southern California studio for over thirty years. For many of those years she searched for a way to offer murals of comparable quality to her hand-painted work at a fraction of the cost. Bloomingtiles is a result of this effort. Julie spends several weeks designing and painting each original in rich, vivid colors and in very fine detail. The artwork is then carefully reproduced in limited quantities using a specially developed technique and ceramic tile pigments similar to those used in her hand-painted tile artwork. Each design is then kiln-fired onto white matte, white glossy or simulated travertine tile, which is kept in stock. All stages of production take place under Julie’s direct supervision. The murals have the same appearance and are just as vivid, detailed and durable as hand-painted kiln-fired murals but are offered at a fraction of the price. Lead times for any of the Bloomingtiles murals are measured in days in contrast to many weeks required to undertake a hand-painted mural. 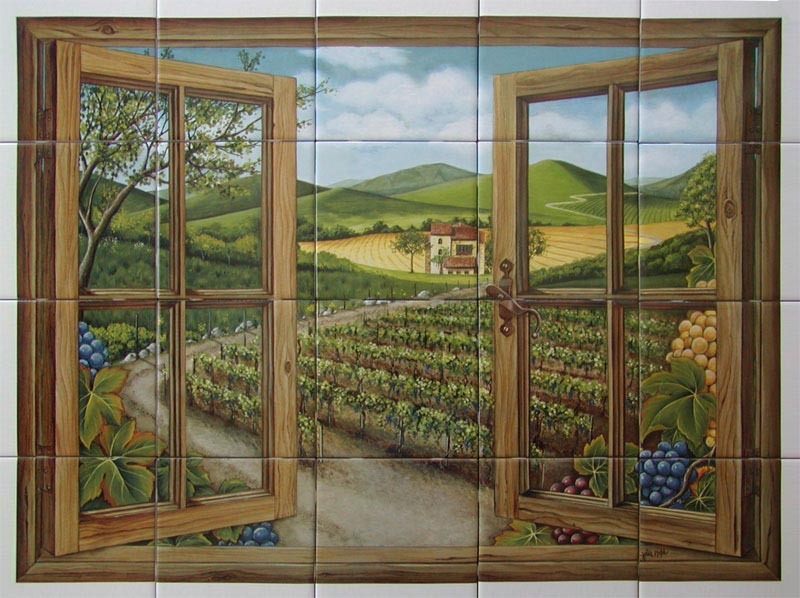 Personalize your home with a custom ceramic tile mural from our collection of Tuscany themed Italian vineyards, wineries, beach scenes, windows, baskets of fruit or flowers, platters of cheese and wine, butterflies, hummingbirds or tropical fish. Custom decorative ceramic tile works beautifully on a kitchen backsplash in a shower, on a bathroom wall or behind a barbecue. Our ceramic tile artwork provides a protective, durable and easy to maintain surface that is heat, splash and stain resistant. 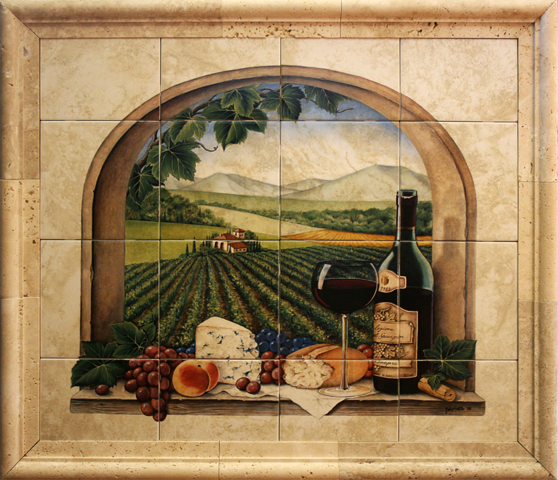 Our ceramic tile art will not fade, is trouble-free and will last a lifetime. 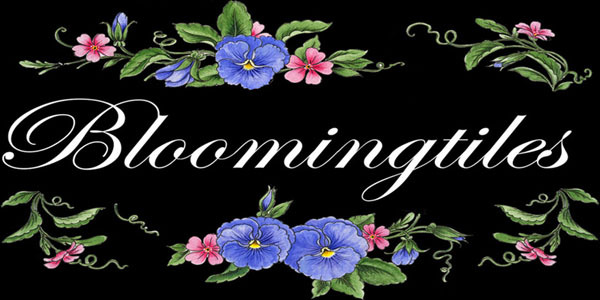 Bloomingtiles® murals and accents will add the perfect decorative touch to your home or business. The kiln-firing process permanently bonds the pigment to the tile glaze and becomes an integral part of it. Thus the design is permanent, will not wear off, won’t fade from ultra violet light and is therefore suitable for both indoor or outdoor and wet or dry applications. If you would like to order a “blank” tile to see the color and texture of the tile that we stock, you may do so on our products page. Stocked tile has been tested by Bloomingtiles and has demonstrated to fire well and render color consistently.